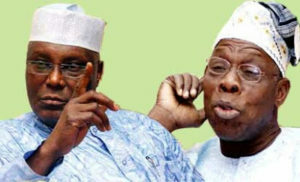 Former Vice President Alhaji Atiku Abubakar who actually served under Chief Olusegun Obasanjo yesterday said, that his former boss, should be held responsible for the current energy crisis in the country. Atiku said this at a book launch in Abuja on Tues¬day. He claimed he suggested to Obasanjo to go for a caustic power station project instead of building gas power stations and that unless the Niger Delta crisis is resolved, dependency on gas for energy will continue to keep the country in darkness.